Marvel at our sheer professionalism as we eventually get the levels right (ish) and only get totally lost a few times. Witness our confusion as we realise that we’re ridiculously behind schedule, then hear our delight when we realise that all the stuff we didn’t fit in means we’ve got less to write for next week’s show. Tom Flanagan’s Schooldays, Lewie vs Ed Sheeran, Roundabout of the Week, News from the Forums and much more. Breaking news about the Stadium development, reviews of the Bradford and Colchester matches and a preview of Coventry. Music from The Wedding Present, Marillion (sorry – blame Modders), The Box Ticked and Snow Patrol (it’s our anthem don’t you know). All wrapped up in a package that ignored the timeline, made it up as we went along and still finished dead on time. If you’ve missed any previous episodes and find yourself thinking that your life won’t be complete until you catch up, we completely understand. You can listen to previous episodes in The MooCamp Radio Show Gallery. Episode one of The MooCamp Radio Show went out on www.secklowsounds.org earlier this evening and, while it was a little chaotic at times, we had some fun. Thanks to those who listened live, thanks to those who got involved by text/phone/email/tweet and thanks to those who took the time to take the piss out of us afterwards – that’s what makes the it all worthwhile. If you weren’t able to listen live, either due to technical problems, or due to the fact that you’ve got a life, then you can download or listen to it below. If you did listen live and you want to listen to it again, then I guess that’s ok too, though I’ll probably judge you. But just a little. 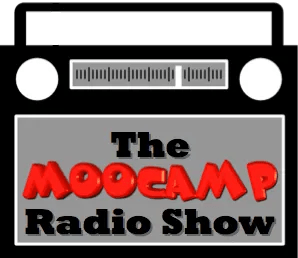 Issue 23 of The MooCamp Radio Show – Download now! Issue 16 of The MooCamp Radio Show – Download Now! Issue 7 – The MooCamp Radio Show – Available Now!